Welcome to our second DogBlog! Two months after the launch of this website, we’ve gone from 292 to 371 members on our Facebook page!!! A huge thanks to all of those who have posted, liked, commented and added others. You’re responsible for the rapid growth of this community! Between them alone, these posters had a total of 1,365 views – WOW!! All in the last month… Keep your posts coming! LET MY DOG IN is proud to support SINBAD – the British Airways Cabin Crew Entertainment Society (BACCES) pantomime – which runs from Wed 28Nov to Sun 02Dec 2018. Ticket prices range between £17.00 and £20.00 and proceeds go to charity. Some days have matinées as well as evening shows. Visit www.bacces.com for more details on what charities have been nominated to benefit from donations. And dig deep into your pockets once inside the theatre: there’ll be programmes for sale, raffle tickets and donation buckets. Every penny will help in breaking last year’s record. Each year BACCES chooses their charities from a long list of worthy causes. This year, the committee wanted to focus on more local and lesser known charities. These will be invited to a private performance of Sinbad and given a donation from this year’s proceeds. I have been blessed in my life so far with two wonderful golden retrievers, both of whom are most beloved, yet quite distinctly different in their quirky, madcap ways. My first and very special golden retriever was Lucy, whose paws made an indelible mark on my heart. I had her from 10 weeks old, a tiny bundle of fluff, who grew to be my best friend. We were inseparable and when I lost her at the incredible age of 17 (about 119 in dog years!) I felt as though my heart had been ripped out. The savagery of the loss of her was almost unbearable, to the point that I couldn’t imagine loving another dog again. Deep down, way below the pain and loss, I knew that I would, but that it would have to be a very special dog to continue with as my canine companion. A couple of years later, I started to feel it was time to look for that special dog. I had already decided that this time, I really wanted to rescue and adopt a dog who had been abandoned and who was very much in need of a loving home. I scoured various dog homes and rescue sites and inexorably came to the point of understanding that while I am an all round dog lover, it is golden retrievers that are and always will be the only dog for me. It was then that I was put in touch with a wonderful charity called Happy Paws, which almost exclusively rescues unwanted golden retrievers – a concept I could scarcely believe could exist. To my mind, the words “unwanted” and “golden retriever” just simply could not sit side by side. It was then that Eddie came into my life, a beautiful, joyous, loving little 3 year old rascal who rescued me just as much as I rescued him. My entry into the world of dog grooming was a natural development from becoming a proud, dog-loving owner. I’d walk Harvey with the local girls of Walworth (South East London) and hear anecdotally how few good local groomers there were. With enthusiasm for my career in aviation waning (20 years, man and boy!) I couldn’t imagine anything better than a new job surrounded by lively, furry friends. Believe me, I haven’t looked back since. Don’t get me wrong, the job can be challenging. Amazingly, having a wash, blow-dry and trim comes a poor second to chasing squirrels and rolling in leaves, apparently…. who would have thought?!? So the way I see it, the primary focus of the job is to put the client (let’s call him Fido) at ease. It’s all about their comfort and cooperation. Lots of kind, encouraging words and cuddles go a long way when they’re on the table and the end result should make them feel like a million-dollar doggy. The best testimonial I’ve had yet was in our local park. A recent client called Ron (Golden Labrador) bounded up and jumped all over me. If they’re not running away, you know you’re doing something right! Growing up I was never able to have a dog due to both of my parents working all day so it wouldn’t have been fair to have one at home locked up all day. Due to this situation I was that annoying child who used to knock on my neighbours’ doors asking if I could take their dog for a walk. Luckily they were often very happy for me to do this for them. Unfortunately, now that I’m all grown up I’m still not able to have a dog due to my work commitments. I work as a full time firefighter and a photographer, so until I can convince my boss to let me bring a dog to the fire station while I’m on shift I’ll have to go without. I’ve always been an animal lover and my passion is to photograph our oceans’ predators in their natural environment. I get a huge buzz from spending a moment with a potentially dangerous animal like a crocodile or a shark and it makes me even happier if I can come home with a striking image to document this. Unfortunately this hobby of mine is hugely expensive so I can often be found travelling around the UK photographing some of our awesome but less dangerous wildlife. Something that does make me happy is the fact that I have been able to combine a passion of photographing animals and my love for spending time with dogs through my pet photography. They said to never work with animals or children and I now know why. I will often have an idea for an image in my mind or perhaps the client will come to me with an idea of the shot they would like me to get. While I can work out the settings, location and lighting that I need, the issue is always how do we get the dog to do that or sit still, facing me and looking in to the camera. Although I don’t have a dog of my own I do have a reasonable selection of balls, toys and treats to use as bribery in the studio. I have also had to learn how to make a particular squeaky noise with my mouth in order to gain the dogs’ attention and hopefully give me that cute little curious head tilt that puppies often do. Obviously some dogs are easier to work with than others but I’m always up for a challenge and it makes it even more special if you are able to get the shot a client wanted when their dog is definitely not up for modelling for me. I am happy to work with dogs both in the studio and on location depending on what the client wants. An idea that I had which is proving popular is something I came up with called “The dog walk sessions”. This is where I accompany them and their dogs at their favourite walk location. I will then just capture shots of the dogs running around doing what they love to do. When it gets to the end of the walk and the dogs are a bit tired and less chaotic that’s when I try to get them to sit still on their own or with their owner for a nice portrait. This approach normally works pretty well and we get a lovely selection of images. Prints are available of my wildlife images and I’d love to hear from you if you are interested in doing a photoshoot with me. Kala was a street dog in India. She was about to be collected and euthanised by the local pound, when John and I rescued her. Since then life has been an adventure. I’ve just written a book about Kala’s rescue to raise money for pet rescue. 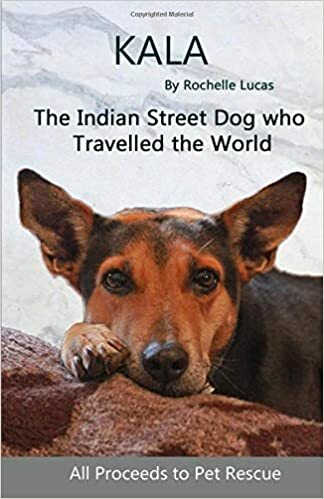 The book is available on Amazon and all proceeds are being donated to charity “Kala, The Indian Street Dog who Travelled the World” by Rochelle Lucas.